How to Care for Car Brakes and Spot Signs of Faults. Few drivers spare a thought for their car’s brakes. Even when traffic ahead slows suddenly, we take it for granted that the brakes will do their job and reduce our speed safely. However, just like tyres, brakes wear down with repeated use over time. This means their performance can diminish, and stopping distances may increase. And when a difference of a few feet can mean avoiding or hitting something, it pays to ensure that one of the most important safety systems on your car is fit for duty. Generally, a car’s braking system requires some simple checks by the driver, and relatively infrequent servicing by a garage. However, there are times when all may not be well. As Road Safety Week gets underway today, here are the things to watch for if you suspect you’re having bother with your brakes. Let’s face it, few drivers these days are particularly comfortable maintaining the mechanical parts of their car, and the brake system is no exception. However, that doesn’t mean you can’t listen out for strange sounds, feel for unusual behaviour or carry out a visual inspection. If any of the following signs are detected, seek advice at a reputable local garage. 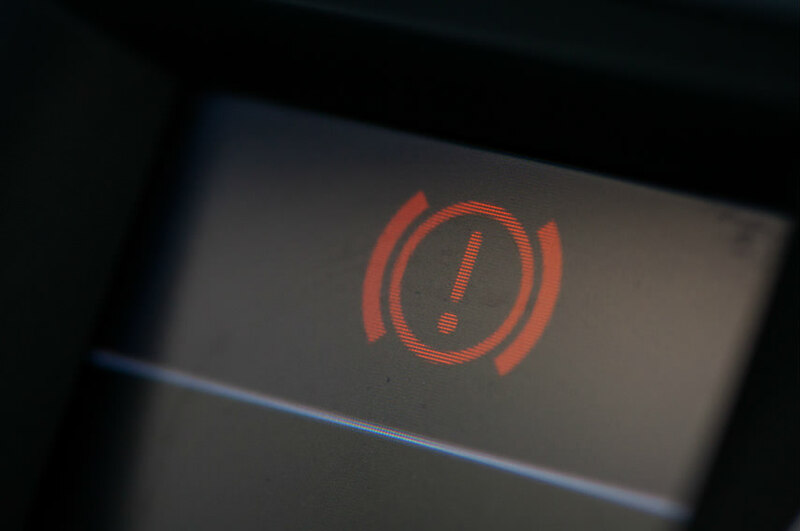 The brake warning light (pictured above) generally appears on the dashboard when a car is started, and turns off once the handbrake is released. If the red warning light illuminates while driving, it means your braking system needs inspecting as soon as possible. Don’t ignore it. It is likely to mean one of two things: that certain parts such as the pads need replacing; equally it could warn of a loss of the hydraulic fluid used to make a braking system work. Either way, have a garage check it. Your ears are a good way of telling you when all is not well with a car’s brakes. As the brake pads, which grip the brake disc to slow the vehicle, wear down and approach the end of their operating life, special steel pins are design to rub against the brake disc, producing a high-pitched squeal. If you hear that, you know it’s time to have new pads fitted. As cars age, it isn’t uncommon for the pistons inside the brake calipers to seize up. This can mean that a brake pad is left pressing against a disc, resulting in a grinding sound that’s especially noticeable if driving with a window open. It may also cause the vehicle to subtly pull to one side of the road. Have it inspected as soon as possible. It could mean the system is less efficient and may cause costly damage to the pad and disc. Does it feel as though you’re having to press the brake pedal harder than you used to, and it’s soft and moving further toward the floor? If so, it’s likely there isn’t enough hydraulic fluid in the braking system, possibly due to a leak or it being old and needing to be replaced. Over time, brake fluid absorbs water from the atmosphere. If it does, the water can turn to vapour as the brakes get hot, which means you have to push the pedal further toward the floor to stop the car. That’s why car makers and garages recommend replacing brake fluid every two years. If you don’t know how to check the level of brake fluid in your car, read the vehicle user manual. For most models, you’ll need to open the bonnet and locate the brake fluid reservoir. This light-coloured plastic container will have marks for the maximum and minimum levels on its side. Ideally the fluid should be close to or at the maximum mark. If you suspect a leak, keep an eye on the level day by day, taking a photograph with your phone. Is there a juddering sensation from your car when you apply the brakes? Maybe the car pulls to one side of the road as you slow? In either case, it could indicate that a disc has been warped. This may reduce its effectiveness, meaning the other discs exert more force and pull the car to one side of the road. Have it checked out by a garage. If the disc does need replacing, it is best practice to fit a new pair, ensuring even performance across the car’s axle. How long should brake pads and discs last? 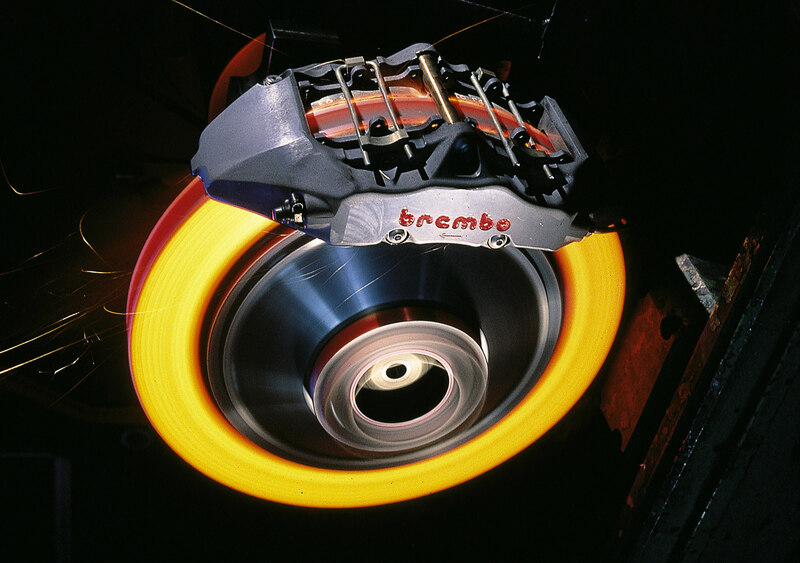 The life of brake parts depends on the driver, the conditions they drive in, the vehicle and parts fitted. Drivers that use their brakes heavily, such as when towing, on long descents, regularly braking from high speeds or grinding their way through stop-start traffic, will wear through pads faster than those that look ahead, anticipate conditions and reduce speed through coasting where possible. The RAC and Kwik Fit suggest the average lifespan for brake pads is 50,000 to 60,000 miles. However, some cars’ parts may last little more than 20,000 miles. To see how far brakes have come over time, watch our video below, featuring rally-driving sensation Chris Ingram. He demonstrates just how effective brakes can be on a modern car – and leaves onlookers shocked at the difference compared to stopping distances given in the Highway Code.